Color: Black head, white cheeks & chinstrap, black neck, brown back and tan breast. Characteristics: Very aggressive in defending their territory. Size: Approximately 30-40 inches long, with a wingspan that spreads between 50 and 70 inches. Potentially Dangerous: To property and crops, not necessarily people. Why Do I Have A Canada Goose Problem? These geese are pest birds that nest in elevated areas, preferably near water. They like to eat green vegetation and grains as well as grass. If you have a tall facility with areas around it that may be inviting to geese, you could have a problem with these birds flocking to your property. What Kind Of Threat Does The Canada Goose Pose? This pest bird’s nesting habits and droppings tend to be detrimental to the structure and appearance of commercial facilities. Droppings may also foul reservoirs and ponds and generally make a mess wherever they fall. 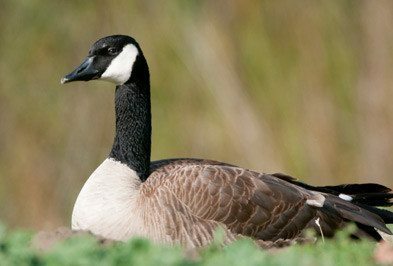 The Canada goose is also a threat to agricultural crops as they are likely to trample and consume them. Golf courses and lawns also suffer aesthetically because of the aggressive and destructive presence of Canada geese. How Do I Control Canada Geese? Controlling this pest bird is not an easy task and should only be attempted by trained bird control professionals. If geese, pigeons or other pest birds are taking over your facilities, contact Holder’s today to find out how we can help. Offering commercial bird control, we are ready to customize a solution to your pest bird problem.